HomeArticlesSlightly Mad Studios Unveils Slightly Mad Specs for Mad Box Console with 90 FPS VR Support! The next-gen of VR hardware is just around the corner and Slightly Mad Studios looks like it wants to get a head start on the competition with their new project, the Mad Box Console, which the company promises will put out a whopping 90 frames per second in virtual reality. Of course, these claims more than made headlines – they made people curious as to what Slightly Mad as working on in their labs. 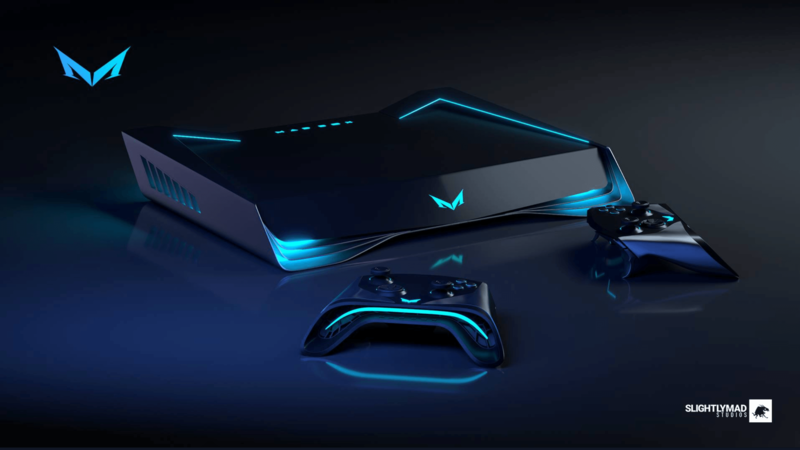 Creators of the popular Project CARS series of games, Slightly Mad Studios isn’t known for their hardware but that could all change with the release of the Mad Box, a device that company CEO Ian Bell calls the “most powerful console ever built” according to Road to VR. We’ve heard these promises before. Do Slightly Mad Studios have anything to back up these radical claims? Slated for launch in three and a half years, the only thing Slightly Mad Studios gave the press was an initial design sketch showing a console in an M shape. Specs aside, pricing was also an ambiguous topic but Bell promised that the Mad Box would have list values similar to other next-gen consoles in the retail market. No one is really sure where those prices are going to land but most optimists are putting the next-gen Xbox and PlayStation at around the current-gen’s launch prices but that could change. One factor that is weighing heavily on predictions about next-gen consoles is the rumor that Microsoft and Sony will offer multiple variants right out of the gate which could establish a floor and a ceiling for the next-gen cycle which muddies the waters even further as for how much the Mad Box could cost. Pressed for more details on Twitter, Bell only delved into the variants of the proposed console design. Most of the console designs are crazy and a bit “garish” as many have pointed out. Still, it has caused people to speculate about what features could be hidden in such a shell. In another hail Mary feature, Bell said that the Mad Box would have cross-functionality online play with all of the other major home consoles such as Microsoft’s next Xbox and Sony’s PlayStation. Given Sony’s reluctance to embrace that model with known players, we raised an eyebrow at that claim. All in all, people are taking the news with a grain of salt. It isn’t that no one wants another player to join the VR fold, it is just tough to get excited about such scant information. This isn’t the first time in the industry a company has moved from developer and publisher and to hardware manufacturer. One of the most prominent examples in the PC space is Valve but, looking at the Steam Box, we don’t know if that bodes well for the Mad Box or not. Whatever happens, you can be sure we will bring you the latest news and up-to-date information.